This is the first of its kind book that gives glimpses of the autographs of eminent Indian personalities of various fields. The book contains around 600 autographs in 8 major groups which are further divided in 42 different categories. In each category about 13 autographs, along with the photographs of the celebrities, are presented. The effort in the book is made to project glimpses of different themes under which autograph collection can be made. Here one can find the autographs and photographs of Indian personalities classified thematically. A very interesting feature of the book is to present some autographs of Indian Princely Rulers. A special feature in this book is an effort to associate Philately with the autographs. 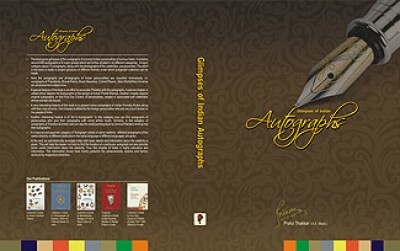 A special chapter is added which depicts the Autographs in the design of Indian Postal Stamps. Another interesting feature is of ‘Art in Autographs’. In this category one can find autographs of personalities who give their autographs with some artistic touch. In a special and separate category of ‘Autograph variety of same celebrity’, different autographs of the celebrity, in different styles and in the same language or different languages, are given. One chapter is added for the foreign personalities who are very much known to the people of India. At the end, an alphabetically arranged Index with basic details and information about the celebrity is given. The information shown here mainly presents the achievements, awards and honors received by respective celebrities.